The industry is no stranger to biometrics – a fingerprint scanner, monitoring employees’ clocking in-and-out times. However, the FPX10 has vastly improved and extended biometric capabilities. Designed and manufactured in Poland, the FPX10 has developed the biometric technology by expanding its functionality and application in businesses. We, at Active Track (Pty) Ltd, are the Polish manufacturer’s preferred African re-seller. While it monitors time and attendance, much in the same way as traditional biometric systems, the FPX10 Biometric is able to capture data through fingerprints, as well as RFID tags. While biometrics generally use a five-point fingerprint recognition, FPX10 relies on a 21-point fingerprint identification, which ensures extremely accurate inputs insofar as the roll-call, and clocking in and out of staff is concerned. In addition to fingerprint identification, FPX10 is equipped with RFID tag recognition. This feature enables the FPX10 to monitor inter alia the movements of valuable assets, by attaching an RFID tag to each item, to be scanned when being checked in and out, respectively. As an additional safeguard, one can demand that employees simultaneously scan their fingerprints, and the relevant RFID tags, when moving assets. The brilliance of monitoring staff and assets with FPX10, is fully portrayed by the device’s GSM functionality, and Active View – FPX10’s web-based support platform. With these capabilities, employers are able to access data, in real-time. This feature allows the employer to determine, at any given time, exactly which employees and/or assets are clocking in or out of the designated premises, and the precise time thereof. Insofar as no-shows, late arrivals and early departures are concerned, the employer can rely on the data as a record of absenteeism, and take disciplinary action against the relevant member of staff. From a cost perspective, the time and attendance data stored on Active View can be integrated into the employer’s payroll system, thereby ensuring that the employer only pays for hours worked – nothing more. In addition, an employer can reduce unwanted overtime, by regularly reviewing the real-time record of time and attendance. At a practical level, the Active View portal allows the customer to edit and update the functionality and intelligence of each of its FPX10 devices, remotely. This would be particularly useful in a security company, where guards are rotated between a range of sites. The security company would simply log on to the portal, and move the relevant guard’s fingerprint intelligence from an FPX10 device stationed at one site, to an FPX10 device stationed at another. Once actioned, the guard would sign on for his shift at the new site, as he had done at the previous site. The data would automatically adjust to reflect the new site on the guard’s profile, stored on Active View. Due to its portable nature, the FPX10 is easy to install, and can be implemented in all labour-intensive industries. In a relatively short space of time, the FPX10 has been implemented in the security, mining, construction, hospitality, medical health, and landscaping industries. This wide-spread implementation bears testament to the diverse functionality and application of the FPX10. 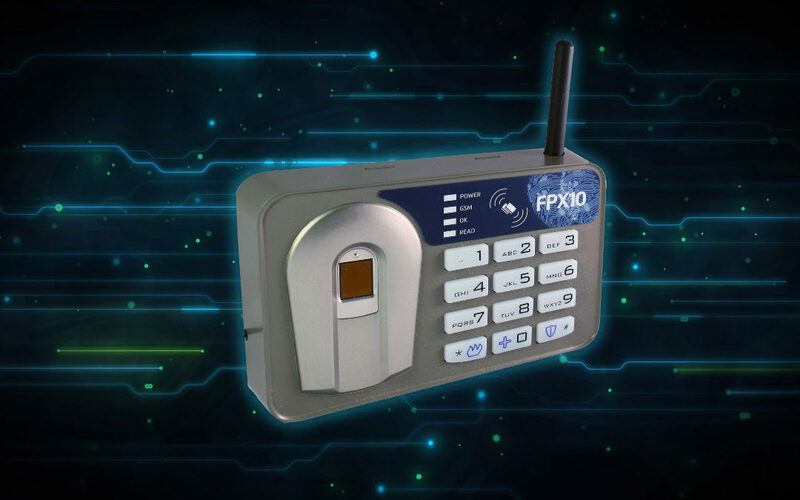 While the primary focus of the FPX10 is to reduce the customer’s payroll, and improve the monitoring of its staff, it also assists in safeguarding the lives of those employees utilising the device, and the premises at which it is installed. This is achieved through pre-programmed stay-awake, fire, medical, and emergency panic activations, which have been successfully relied on in distress situations. In striving to be the lead supplier of FPX10 in Africa, Active Track (Pty) Ltd incorporates maintenance and technical support into the customer’s monthly rental fee. This monthly rental fee is substantially lower than industry standard. Reducing these costs, and implementing fixed monthly figures, offers us a sizeable advantage over competitors offering similar biometrics. We, at Active Track (Pty) Ltd, invite you to contact us to arrange a demonstration on the FPX10 Biometric – the sophisticated professional in biometric technology.